Colin Daniel misses tomorrow's game. Peterborough United manager Steve Evans insists it will be a dogfight between numerous clubs for promotion from League One this season. And Evans believes his team have the qualities to achieve their ultimate goal if they can get their home form up to the standards of their away form. Posh have won six and drawn one of seven away matches on the road this season ahead of tomorrow’s trip to Burton Albion. Evans also believes Burton will be in the shake-up if they can keep star striker Liam Boyce fit. “I rate Boyce highly,” Evans stated. “The difference in Burton’s performances when he plays and when he doesn’t play is chalk and cheese. “He will be a big threat on Saturday, but I am backing my lads to nullify him. Ched Evans was a big threat for Fleetwood the other night, but we dominated him. “It’s a tough game for us at the Pirelli Stadium as Burton are starting to show their true form. They will be there or thereabouts at the end of the season as will many other teams. “It will be a dogfight between now and May. It’s so hard to win games in this division. “Look at Barnsley. They were so impressive when they beat us and yet they have now lost two games in a row. Teams like Luton are hitting form, Portsmouth are enjoying a great season and others will improve and challenge. “My only concern is the Sunderland juggernaut which is gathering pace, but I don’t see anyone running away with it. “Obviously we need to get our home form in line with our away form, but I am confident that will happen soon enough. “Competition for places is hotting up which can only be a good thing. I have some serious thinking to do before the Burton game even though we have played the same way in every away game so far with great success. 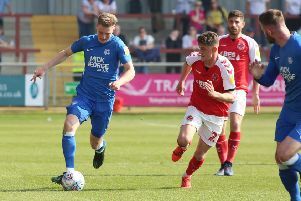 Evans will have to make one change as left-back Colin Daniel is suspended for one match after collecting his fifth caution of the season against Fleetwood on Tuesday. Tyler Denton, a left-back on loan from Leeds United, could make his first League One appearance of the season in Daniel’s place.